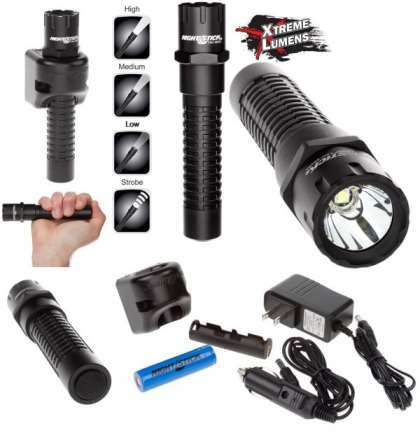 Nightstick Xtreme Lumens Metal Multi-Function Tactical Flashlight - RechargeableCASE OF 2 This compact rechargeable multi-function metal Xtreme Lumens tactical flashlight uses a CREE LED rated at 800 lumens that works in conjunction with a high-efficiency deep parabolic reflector to create a usable beam rated at 205 meters. The tail-cap switch provides momentary or constant-on functionality, a set of user-selectable high, medium or low-brightness settings as well as a disorienting strobe. The housing and tail-cap are made from aircraft-grade 6061-T6 aluminum and have a Type 3 hard anodized finish. Power comes from a rechargeable Lithium-ion battery and includes the ability to run from a pair of CR-123 batteries (batteries not included) thanks to the CR-123 Battery Carrier (included).